Goodreads: A thriving bakery. A lighthouse to call home. A handsome beekeeper. A pet puffin. These are the things that Polly Waterford can call her own. This is the beautiful life she leads on a tiny island off the southern coast of England. Kritters Thoughts: The second in a series which I absolutely recommend starting at book 1, so if you haven't read book 1, you may want to pause here and go read before reading my review! We return to Polly who is in a groove in the bakery and loving managing them and creating breads and treats for this small town, but of course happiness can never last long in a book! 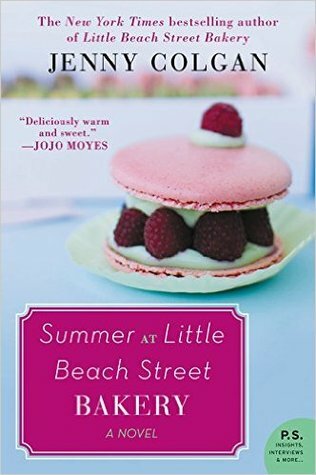 She hits a roadblock when the owner of the bakeries passes away and her family wants to come in and make them more "efficient." Polly must roll with the tides of this small town living in a lighthouse. The pace of the book is the best thing for this book. It just moves so well. There was a lot of drama and ups and downs, but they were perfectly dispersed amongst quiet moments. I felt the quiet small town of this book in the pacing of it and I just loved it. It still isn't beach weather here, in fact it was snowing the day I read this, but I would say grab book 1 and 2 and take them to a week at the beach. It isn't beach weather here either but today I am able to keep my doors open to let in some fresh (though slightly chilly) air for the first time. Makes me long for the beach for sure!